Overview: If you are worthy, it is time to hold up the hammer and possess the power of Thor. Welcome back to another Essential Thor volume. 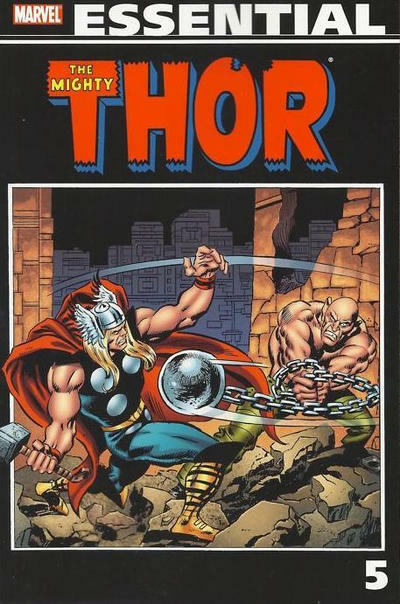 In this volume, Thor battles new foes such as Ego-Prime and Mercurio, but must still deal with familiar villains such as Pluto, the Absorbing Man, and Loki. Of course, Thor’s ego gets the better of him once again in Asgard, and Odin banishes his son (and some of his friends) to Earth for some time. Which leads to some humorous moments as the Asgardians hanging out at Avengers Mansion with Jarvis, the butler. A battle with Ulik forces Thor and his friends to return to Asgard, which they find empty of all people. That mystery leads them into space chasing intergalactic slavers. That, in turn, leads to another battle against Mercurio, whom we thought was destroyed six issues past. Finally, Thor defeats all enemies, and returns to Asgard with his friends and Odin, only to find Asgard ruled by another Thor and Odin. Confused yet? Trust me, go pick up this volume and see how this wraps up! An interesting insert occurs with issue #200. I don’t know if this was planned from the start for the anniversary issue, or the need to meet a production deadline, but this appears to be a filler issue by Stan Lee and John Buscema (with a prolog and epilog by Gerry Conway and Buscema). It has nothing to do with issues #199 or #201, which makes me lean towards Marvel just trying to meet a deadline. Anyway, Lee gets the chance to tell his take on the Ragnarok story, which according to Norse legend is the end of the gods in a final battle. In Asgard, Odin has a prophetess share how the Ragnarok would play out: Loki triggers the start of Ragnarok, then does battle with Thor while the world around them falls. The Asgardians and the world dies and is reborn again. As the prophetess ends her tale, Odin cautions Loki that only those deemed worthy are reborn in the new world, and Loki slinks off wondering if he is part of that number. What makes this Essential? : The stories in this volume are interesting. Not Gerry Conway’s best work ever, but by no means his worst work either. The stories split nearly evenly between those on Earth, those on Asgard, and those in space. The Earth and Asgard stories seem to be the more-complete stories, but the space stories feel like they are not fully complete. Almost like Conway wanted to do something a little more with them but held back, either by choice or editorial constraint. Buscema’s art once again shows the epic proportions of Thor and his entourage. These stories are an interesting read for a Thor fan, but I don’t know if I would say these are truly Essential. Footnotes: Thor makes his first visit to Rutland, Vermont, in Thor #206 and #207. For more information on Rutland, see Essential Avengers Vol. 4. If you like this volume, try: the Ragnarok story from 2004 from Michael Avon Oeming and Andrea DiVito. This wrapped up the 1998 Thor series, as all of the Avengers-related titles were disassembling around the characters (and the readers). The Thor story was the best ending of those titles, Once again, Loki has aspirations of taking over the throne of Asgard, and resurrects Surtur to begin the Ragnarok. Over the course of six issues, spanning many months, the various Norse gods meet their demise in battle. At the end, Thor beheads Loki, and places himself into hibernation, until it is time for Thor to return. This story has been collected in two editions – a 2009 Avengers Disassembled hardcover that collected the ends of the Thor, Captain America, and Iron Man titles; and a 2005 Thor: Disassembled trade paperback. This entry was posted in Marvel Essentials, Thor and tagged Gerry Conway, John Buscema, Thor. Bookmark the permalink. Pingback: Throwback Thursday – Essential Thor Vol. 5 – WORST. COMIC. PODCAST. EVER!